The Portland Vintage Races were held from July 10th to July 12th and weather could not have been better. The car corrals were down but the overall attendance was up. That’s a good sign as interest in the races is improving again. 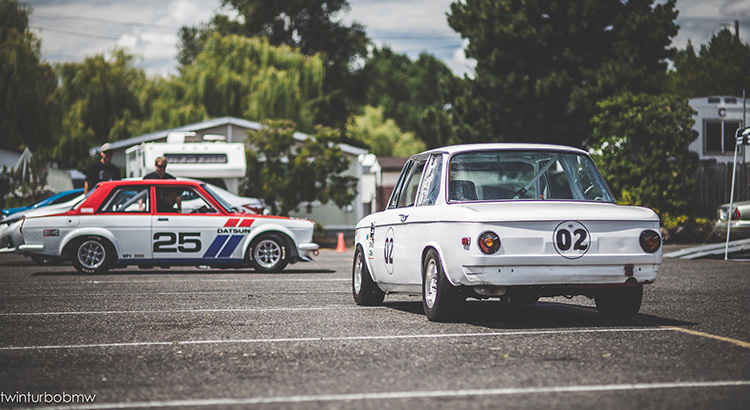 Seeing vintage cars race each other around PIR is a thrilling event for all ages. There were many changes this year and when it was all said and done, there were a lot of happy smiling faces for all those that took part in the festivities. Jaguar and Land Rover were the title sponsors and their presence did not disappoint. Jaguar brought 7 F-Type S’s for autocrossing. They also brought famous race car drivers like Roberto Guerrero for instruction while you get to drive the course! Some people were disappointed that they didn’t get to drive their own car on the autocross but everyone was impressed with the power and handling of the F-Types. And you don’t have to buy new tires and brakes afterwards! Land Rover brought Range Rovers to the dirt track to show what they can do. Many people, including yours truly, had never taken a vehicle to such extreme angles and rough terrain. The off road capability of these vehicles is impressive. Our BMW CCA corral was impressively professional this year. Our President Dan Hones made up large flags with our redesigned logo which looks like it came straight from BMW. Inside the flags in front of our tents, we presented the i8, the halo car of BMW. Jon Taylor of Salem BMW brought the car to display, and he opened it up for everyone to have a seat. That is a first, for access to this great car. When it came time for the parade lap around the racetrack Jon handed me the key and said take it out! So with a huge smile on my face I led our group for a spirited ride around PIR. Vince Manley was right behind me in his beautiful 3.0csi. The sentimental favorite this year was Dave & Cheryl McIntyre’s newly restored VW Beetle. When Cheryl was born she was brought home in the car and Dave beautifully restored it. Scott Welch brought is E21 320is, which is the 3er that started it all. And my personal heartstopper this year, was a 1973 2002tii in Inca Orange. Paul Winterton drove down from Vancouver BC to attend the races and join our corral. There were many other amazing BMW’s from vintage to new to be impressed by. It’s an impressive sight. On both days we had a BBQ lunch for everyone in our corral. I don’t know what changes will be in store for next year but I’m happy about the support our club gives to this amazing event. I want to continue to grow the participation in this amazing weekend and I hope to see you at next year’s Portland Vintage Racing Festival. Check out all of the photos from this event in the gallery!